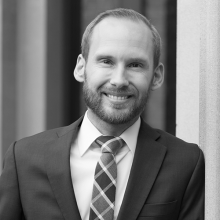 Michael Houlberg is a manager for special projects at IAALS, with a focus on our work toward improving the family court process by promoting greater accessibility, efficiency, and fairness to everyone involved. Houlberg helps manage the Court Compass Project and the Family Justice Initiative by providing support through research, writing, and communicating with stakeholders. Houlberg joined IAALS in 2018 after working for both private and nonprofit organizations. He started his legal career working with Towards Justice, a Colorado nonprofit organization that fights for workers who have experienced wage theft. Houlberg then transitioned to workers’ compensation defense with Pollart Miller, LLC, where he litigated claims on behalf of employers and insurance companies. Desiring to return to nonprofit work and help provide others with greater access to the courts, Houlberg joined the National Center for State Courts and worked on projects that involved the implementation of a statewide case management system and the creation of a juvenile court specifically tailored to youth involved in gun violence. He is excited to increase the reach of his work to both state and federal courts through his work at IAALS. Houlberg also volunteers as a Court Appointed Special Advocate (CASA), which involves advocating for the safety and well-being of children who have been removed from their homes due to abuse and neglect. Houlberg graduated from the University of San Diego School of Law in 2015. He received his Bachelor of Science in Psychology from Brigham Young University and is a member of Psi Chi, the International Honour Society in Psychology.